Families are not visitors to our hospitals, clinics, or continuing care centres and homes. Families are essential partners in healthcare. When you decide to talk about or learn more about family presence, you are helping to change the outdated culture of ‘families as visitors’. Read Linda’s story to understand what Family Presence means to a patient. Read Behind Our Silence to understand what Family Presence means to a family. Click on the above image to view and download. 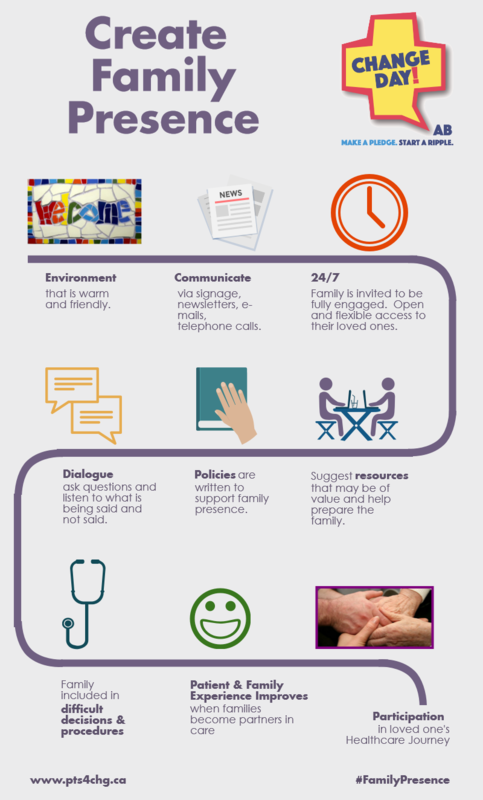 Make 24/7 #FamilyPresence your Change Day pledge! What do families and friends want more than anything? They want to be there for their loved ones when they are in healthcare facilities! An Alberta patient advisor Twitter poll recently found that 86% of the respondents wanted 24/7 access to their loved ones receiving healthcare services, and to feel welcomed as a full partner in their family member’s health experience. This is not just a local/provincial issue but also a national and international trend, supported by a movement called Better Together. Currently, there are few hospitals in Alberta that have 24/7 policies and practices in place. Why not make a related ChangeDayAB pledge? Your pledge could be an important anchor that keeps healthcare providers (i.e., nurses, doctors, specialists) and all other healthcare staff, focussed on how best to respond to your loved one’s needs. Your actions can help improve how our healthcare service in Alberta responds to you or your loved one’s health needs. Need more help changing the concept of families as visitors?